Rohde & Schwarz will present a novel 5G channel sounding solution in cooperation with Fraunhofer Heinrich Hertz Institute (HHI) at the NGMN Industry Conference in Frankfurt/Main. The solution comprises the R&S SMW200A vector signal generator and the R&S FSW signal and spectrum analyzer in combination with a synchronization unit and application software from Fraunhofer HHI. The test solution supports the research activities aimed at exploiting the microwave and millimeter-wave spectrum within 5G networks. For decades, propagation conditions in cellular networks have been well understood in the frequency bands from 450 MHz to 3 GHz. Starting with the commercialization of GSM systems, channel models were developed based on this knowledge. These are widely used to verify base station and end user device performance in the lab by simulating real-world conditions. In contrast to these legacy frequency bands, knowledge of the radio channel at frequencies above 6 GHz is still limited. Although a significant amount of channel sounding campaigns have been conducted and many results published, new spectrum in the discussed range from 6 GHz to 100 GHz requires much more measurement data. Multiple research projects as well as the upcoming 3GPP standardization need comprehensive measurement data in order to derive suitable channel models for efficient testing in future. The solution demonstrated comprises the R&S SMW200A vector signal generator and the R&S AFQ100B I/Q baseband generator on the transmitter end and the R&S FSW signal analyzer on the receiver end. The transmitter and receiver are synchronized and triggered by high-precision clocking units from Fraunhofer HHI, which also serve as absolute time bases with an accuracy of 2 ns. The R&S SMW200 and R&S AFQ100B provide a wideband sounding signal with up to 500 MHz signal bandwidth and up to 40 GHz carrier frequency. The sounding signal is based on an optimized correlation sequence. The R&S FSW receives this signal up to a carrier frequency of 67 GHz, and demodulates and samples it using its built-in 500 MHz demodulator. Application software from Fraunhofer HHI postprocesses the demodulated signal and estimates channel impulse responses in the time and delay domains. The same measurement concept could be extended for measurements above 40/67 GHz by adding external up/downconverters on both ends. 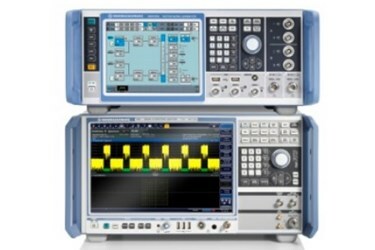 A 2 GHz demodulation bandwidth could also be realized using a wideband I/Q baseband generator from Fraunhofer HHI on the transmitter end and by adding the R&S RTO oscilloscope as well as the newly released R&S FSW-B2000 frequency range extension option for the R&S FSW on the receiver end. This flexible solution would provide an excellent dynamic range with a multipath resolution down to 0.5 ns. Rohde & Schwarz and Fraunhofer HHI will demonstrate their solution at the NGMN Industry Conference & Exhibition, which takes place March 24 to 25, 2015, in Frankfurt/Main. The Rohde & Schwarz electronics group offers innovative solutions in the following business fields: test and measurement, broadcast and media, secure communications, cybersecurity, radiomonitoring and radiolocation. Founded more than 80 years ago, this independent company has an extensive sales and service network and is present in more than 70 countries. The electronics group is among the world market leaders in its established business fields. On June 30, 2014, Rohde & Schwarz had approximately 9800 employees. It achieved a net revenue of EUR 1.75B in the 2013/2014 fiscal year (July to June). The company is headquartered in Munich, Germany. It also has regional headquarters in Singapore and Columbia, Maryland, USA, to manage its operations in these regions.